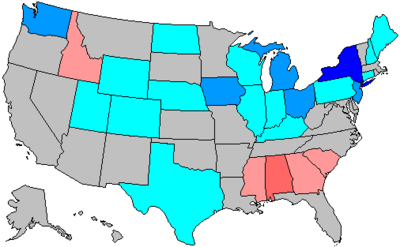 The 1964 United States House of Representatives elections was an election for the United States House of Representatives in 1964 which coincided with the election to a full term of President Lyndon B. Johnson. 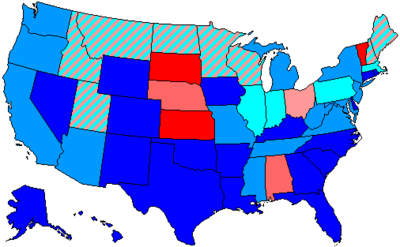 Johnson's landslide victory over Barry Goldwater allowed his Democratic Party to gain a net of 36 seats from the Republican Party, giving them a two-thirds majority in the House. This is the largest House majority held by either party since 1936. The election also marked the first time since Reconstruction that Republicans made inroads in the deep South. California 5 John F. Shelley Democratic 1949 (Special) Incumbent resigned January 7, 1964, to become Mayor of San Francisco. Tennessee 2 Howard Baker Sr. Republican 1950 Incumbent died January 7, 1964. New member elected March 10, 1964 to finish her husband's term. Pennsylvania 5 William J. Green Jr. Democratic 1944 Incumbent died December 21, 1963. Alabama 5 Armistead I. Selden Jr.
Alabama 6 George Huddleston Jr.
Alabama 8 Robert E. Jones Jr.
California 27 Everett G. Burkhalter Democratic 1962 Incumbent retired. California 33 Harry R. Sheppard Democratic 1936 Incumbent retired. California 38 Patrick M. Martin Republican 1962 Incumbent lost re-election. Colorado 2 Donald G. Brotzman Republican 1962 Incumbent lost re-election. Colorado 3 John Chenoweth Republican 1950 Incumbent lost re-election. Connecticut 4 Abner W. Sibal Republican 1960 Incumbent lost re-election. Georgia 2 J. L. Pilcher Democratic 1953 Incumbent retired. Georgia 3 Tic Forrester Democratic 1950 Incumbent retired. Georgia 6 John James Flynt Jr.
Hawaii at-large Thomas Gill Democratic 1962 Incumbent retired to run for U.S. Senator. Idaho 2 Ralph R. Harding Democratic 1960 Incumbent lost re-election. Illinois 7 Roland V. Libonati Democratic 1957 Incumbent retired. Illinois 9 Edward Rowan Finnegan Democratic 1960 Incumbent retired. Illinois 14 Elmer J. Hoffman Republican 1958 Incumbent retired. Illinois 19 Robert T. McLoskey Republican 1962 Incumbent lost re-election. Indiana 9 Earl Wilson Republican 1960 Incumbent lost re-election. Indiana 11 Donald Cogley Bruce Republican 1960 Incumbent retired to run for U.S. Senator. Iowa 1 Fred Schwengel Republican 1954 Incumbent lost re-election. Iowa 2 James E. Bromwell Republican 1960 Incumbent lost re-election. Iowa 4 John Henry Kyl Republican 1959 Incumbent lost re-election. Iowa 6 Charles B. Hoeven Republican 1942 Incumbent retired. Iowa 7 Ben F. Jensen Republican 1938 Incumbent lost re-election. Kansas 2 William H. Avery Republican 1954 Incumbent retired to run for Governor. Kentucky 3 Gene Snyder Republican 1962 Incumbent lost re-election. Kentucky 5 Eugene Siler Republican 1954 Incumbent retired. Louisiana 8 Gillis William Long Democratic 1962 Incumbent lost renomination. Maine 2 Clifford McIntire Republican 1951 Incumbent retired to run for U.S. Senator. Maryland 5 Richard E. Lankford Democratic 1954 Incumbent retired. Michigan 2 George Meader Republican 1950 Incumbent lost re-election. Michigan 3 August E. Johansen Republican 1954 Incumbent lost re-election. Michigan 11 Victor A. Knox Republican 1952 Incumbent lost re-election. Harold M. Ryan Democratic 1962 Incumbent lost renomination. Michigan 16 John D. Dingell Jr.
John Lesinski Jr. Democratic 1950 Incumbent lost renomination. Mississippi 4 W. Arthur Winstead Democratic 1942 Incumbent lost re-election. Nebraska 1 Ralph F. Beermann Republican 1960 Incumbent lost re-election. New Hampshire 1 Louis C. Wyman Republican 1962 Incumbent lost re-election. New Jersey 2 Milton W. Glenn Republican 1957 Incumbent lost re-election. New Jersey 3 James C. Auchincloss Republican 1942 Incumbent retired. New Jersey 9 Frank C. Osmers Jr. Republican 1951 Incumbent lost re-election. New Jersey 12 George M. Wallhauser Republican 1958 Incumbent retired. New Mexico at-large Joseph M. Montoya Democratic 1957 (Special) Incumbent retired to run for U.S. Senator. New York 3 Steven Boghos Derounian Republican 1952 Incumbent lost re-election. New York 5 Frank J. Becker Republican 1952 Incumbent retired. New York 21 James C. Healey Democratic 1956 Incumbent lost renomination. New York 23 Charles A. Buckley Democratic 1934 Incumbent lost renomination. New York 25 Robert R. Barry Republican 1958 Incumbent lost re-election. New York 27 Katharine St. George Republican 1946 Incumbent lost re-election. New York 28 J. Ernest Wharton Republican 1950 Incumbent lost re-election. New York 31 Clarence E. Kilburn Republican 1940 Incumbent retired. New York 34 R. Walter Riehlman Republican 1946 Incumbent lost re-election. New York 37 Harold C. Ostertag Republican 1950 Incumbent retired. New York 39 John R. Pillion Republican 1952 Incumbent lost re-election. New York 40 William E. Miller Republican 1950 Incumbent retired to run for Vice President. North Dakota 2 Don L. Short Republican 1958 Incumbent lost re-election. Ohio 1 Carl W. Rich Republican 1962 Incumbent lost re-election. Ohio 3 Paul F. Schenck Republican 1951 Incumbent lost re-election. Ohio 10 Homer E. Abele Republican 1962 Incumbent lost re-election. Ohio at-large Robert Taft Jr. Republican 1962 Incumbent retired to run for U.S. Senator. Oklahoma 6 Victor Wickersham Democratic 1960 Incumbent lost renomination. Pennsylvania 7 William H. Milliken Jr. Republican 1958 Incumbent retired. Pennsylvania 19 George Atlee Goodling Republican 1960 Incumbent lost re-election. Pennsylvania 24 James D. Weaver Republican 1962 Incumbent lost re-election. Tennessee 2 Irene Baker Republican 1964 Incumbent retired. Tennessee 6 Ross Bass Democratic 1954 Incumbent retired to run for U.S. Senator. Tennessee 9 Clifford Davis Democratic 1940 Incumbent lost renomination. Texas 5 Bruce R. Alger Republican 1954 Incumbent lost re-election. Texas 15 Joe M. Kilgore Democratic 1954 Incumbent retired. Texas 16 Ed Foreman Republican 1962 Incumbent lost re-election. Utah 2 Sherman P. Lloyd Republican 1962 Incumbent retired to run for U.S. Senator. Virginia 3 J. Vaughan Gary Democratic 1945 Incumbent retired. Washington 2 Jack Westland Republican 1952 Incumbent lost re-election. Washington 5 Walt Horan Republican 1942 Incumbent lost re-election. Washington 6 Thor C. Tollefson Republican 1946 Incumbent lost re-election. Washington 7 K. William Stinson Republican 1962 Incumbent lost re-election. West Virginia 5 Elizabeth Kee Democratic 1951 Incumbent retired. Wisconsin 1 Henry C. Schadeberg Republican 1960 Incumbent lost re-election. Wisconsin 6 William Van Pelt Republican 1950 Incumbent lost re-election. Wyoming at-large William H. Harrison Republican 1960 Incumbent lost re-election.